Do you need a DNA test? which test do you need? homeDNAdirect is your experienced DNA testing provider offering parentage, relationship, clinical, health as well as a range of other DNA tests. Our complete portfolio of DNA tests means we can solve any of your relationship queries. homeDNAdirect’s accredited, 21 genetic marker DNA paternity test for one alleged father and child is priced at only $129. With 99.99% accurate results you need not look elsewhere to get the answers you need. We keep things simple for you and in just a few steps you can get your DNA test results. Order your test, receive your kit, return your samples and receive your results. To ease that edge off when it comes to waiting for your results, we ensure that your test results are ready within only 3-5 working days (this applies to most but not all of our tests). We understand that clients need peace of mind and choosing a reliable genetic testing provider is of utmost importance, providing you with the reassurance and emotional calmness you need. Our DNA testing laboratory is ISO 17025 accredited and the testing laboratory has conducted over 300,000 DNA tests, using state of the art technology and adhering to the strictest quality control guidelines- this is all part and package of your accuracy guarantee. Even in cases where you and other participants are in different areas, we can efficiently organise the DNA test from beginning to end. homeDNAdirect also has over 10 offices around the world, including regional offices in Canada, Australia and the United Kingdom – which means we can test individuals in any part of the world. homeDNAdirect also offers legal testing, clinical testing as well as health and animal DNA testing services. Results for legal testing are court admissible and sampling is done following the chain of custody required in legal cases. Our tests are accepted in courts across the United States as well as by the US Citizenship and Immigration services. Our prenatal testing include a 100% risk free prenatal DNA paternity test that can determine paternity from your 10th week with 99.9% accuracy using only maternal blood samples as well as our non-invasive prenatal screening test for Down’s syndrome. 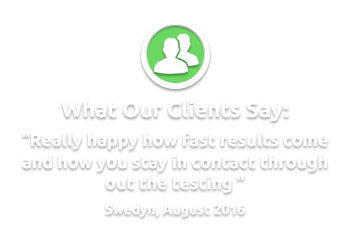 Our highly experienced customer service team are waiting to assist you and will be happy to guide you throughout your testing process through live chat, email or contact request. For a full list of DNA tests, click here.